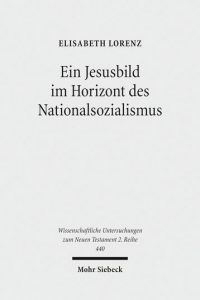 Review of Elisabeth Lorenz, Ein Jesusbild im Horizont des Nationalsozialismus. Studien zum Neuen Testament des “Instituts zur Erforschung und Beseitigung des jüdischen Einflusses auf das deutsche kirchliche Leben” (Tübingen: Mohr Siebeck, 2017). Pp. 539. ISBN: 978-3-16-154569-6. This book by Elisabeth Lorenz is based on her dissertation, which was submitted in 2015 at the University of Regensburg. The focus of the book is the “dejewified” New Testament, The Message of God (Die Botschaft Gottes), which was published in 1941 by the Institute for the Study and Eradication of Jewish Influence on German Church Life, also known as the Eisenach Institute. Several monographs have been published in the last ten years about this institute, founded by the German Christians in 1939. However, the “dejewification” of the New Testament has only been the subject of shorter published articles, making the relevance of this work obvious. Lorenz’s goal is to compare New Testament passages from The Message of God with the Luther Bible, the standard translation, and the original Greek text. For this purpose, Lorenz has chosen three central terms by means of which she tries to analyze the new interpretation in The Message of God. Chapter 2 deals with the Messiah concept and the relationship between Jesus and Judaism. Chapter 3 places the concept of sacrifice at the heart of the comparison. Chapter 4 deals with the portrayal of Jesus in the New Testament traditions in comparison with Jesus’ presentation in The Message of God. The focus on concepts rather than merely on individual passages is very welcome, since, for example, in dealing with the Messiah concept, the entire Christology of The Message of God and thus of the German Christians can be derived, as Lorenz rightly states (83). The contrasting juxtaposition of the single text passages in the form of tables makes it easier for the reader to understand the different wording in The Message of God, the standard translation, as well as the Luther translation quickly and clearly. Based on such juxtapositions, Lorenz is able to demonstrate that, for example, in relation to the Messiah concept in The Message of God, there has been a significant interference with the other translations. The aim was to put Jesus in opposition to the Jewish Messiah conceptions (93). Ultimately, all these revisions were aimed at highlighting Jesus’ opposition to Judaism, as the editors of The Message of God understood Jesus not as a Jew but rather as a fighter against Judaism. It is here that the weak point of the book emerges: Lorenz does not pay attention to significant publications on the German Christians and the Eisenach Institute and, as a result, produces several misinterpretations. For instance, she understands the intention of publishing the “dejewified” New Testament as a passive, defensive reaction against the background of anti-Semitic Nazi ideology (492). Lorenz even goes so far as to suggest that the editors of The Message of God had no awareness of the consequences of their work (492). Unfortunately, Lorenz repeatedly refers to the theologian Karl-Wilhelm Niebuhr for information on the Institute’s work. In research on the Eisenach Institute, however, Niebuhr receives very little attention because he does not argue historically but exclusively apologetically. If the author had referred to central works such as those by Susannah Heschel (only two older papers by Heschel are referenced), Manfred Gailus (who is not named at all), or other researchers, such erroneous conclusions could have been avoided. The members of the Eisenach Institute were always aware of the consequences of their anti-Semitic works. The intention behind books such as The Message of God was an active disengagement of Jesus from its Jewish context, in order to provide a basis for the anti-Semitic goals of the German Christians and their institutes that existed from the beginning. Future research on the Eisenach Institute needs to pay attention to Lorenz’s book, since it has bridged a gap that previous research had not closed yet. The detailed comparison of selected New Testament terms between The Message of God and classical Bible translations has succeeded and deserves a high degree of recognition. Unfortunately, this cannot be said for the historical classification and the intention of the Eisenach Institute and its “dejewified Bible,” because Lorenz has not followed the relevant research on the German Christians and the Institute. This is a pity. As a result, Lorenz issues judgments in some passages of her very good book that are simply no longer tenable due to the current state of research.